FILE - Palestinians receive food aid at a U.N. Relief and Works Agency warehouse in the Shati refugee camp, Gaza City, Jan. 14, 2018. The United States said Tuesday it is withholding tens of millions of dollars from the U.N. agency that supports Palestinian refugees, and could cut more if reforms are not made. U.S. State Department spokesperson Heather Nauert confirmed to reporters that the Trump administration will withhold $65 million dollars from its initial 2018 contribution to the U.N. Relief and Works Agency (UNRWA). She said a $60 million tranche would be disbursed to avoid having a "negative impact." The U.S. gives about $364 million annually to UNRWA, paid in two installments, making it the agency's top donor. FILE - State Department spokeswoman Heather Nauert speaks during a briefing at the State Department in Washington, Aug. 9, 2017. Asked if the funding cut is the result of President Donald Trump's January 2 tweet criticizing the Palestinian Authority for not offering "appreciation or respect" for U.S. assistance and a Palestinian lack of willingness to engage in peace talks with Israel, Nauert referred reporters to the White House for comment. "I can tell you that it has long been a concern of this administration — a year into the administration — about UNRWA and how it handles itself and manages its money," she added. "We don't believe that taking care of other nations and other people has to solely be the United States' responsibility," Nauert said, adding that Washington is asking other countries to contribute more to UNRWA. NRWA's top 10 donors provide over 80 percent of the agency's income. They include after the United States, the European Union, Germany, Sweden, Britain, Saudi Arabia, Japan, Switzerland, Norway and the Netherlands. UNRWA provides education and health services to five million Palestinians in the West Bank, Gaza Strip, Syria, Lebanon and Jordan. 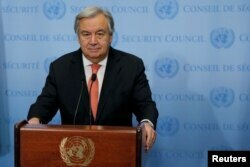 Less than two hours before the U.S. announcement, U.N. Secretary-General Antonio Guterres said at a news conference that he had not been officially informed of the decision. But he warned that such a substantial funding cut would hurt. FILE - U.N. Secretary-General Antonio Guterres speaks in New York, Dec. 6, 2017. "It is an important factor of stability, so if UNRWA will not be in a position to provide the vital services and the emergency forms of support that UNRWA has been providing, these will create a very, very serious problem, and we will do everything we can to avoid the situation to occur," he told reporters. The U.N. chief also noted that the "relationship between the U.S. and the Palestinian Authority is difficult and complex at the moment," and he hoped it would not undermine the possibility of peace talks. Last month, the Trump administration wielded its first U.N. veto to block a Security Council resolution rejecting the U.S. decision to recognize Jerusalem as the capital of Israel and move its embassy there. The United States was isolated in the vote, with the other 14 council members voting in favor of the text. Arab nations then moved to the General Assembly, where the resolutions are more symbolic but there is no veto, and got the measure adopted with overwhelming support. "The United States will remember this day in which it was singled out for attack in the General Assembly for the very act of exercising our right as a sovereign nation," U.S. Ambassador Nikki Haley warned ahead of the vote. 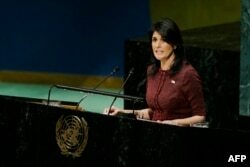 FILE - United States Ambassador to the United Nations Nikki Haley addresses the General Assembly prior to the vote on Jerusalem, at U.N. headquarters in New York, Dec. 21, 2017. "We will remember it when we are called upon to once again make the world's largest contribution to the United Nations, and we will remember it when so many countries come calling on us, as they so often do, to pay even more and to use our influence for their benefit." Israel's U.N. ambassador Danny Danon welcomed the U.S. announcement of the funding cut to UNRWA. "UNRWA has proven time and again to be an agency that misuses the humanitarian aid of the international community and instead supports anti-Israel propaganda, perpetuates the plight of Palestinian refugees and encourages hate," Danon said. "We hope that the U.S. administration and Congress can cooperate in reversing this politically motivated cut in aid before its effects ripple through the Middle East," said Jan Egeland, secretary-general of the Norwegian Refugee Council. "In the meantime, we call on other donor nations to stand with UNRWA and Palestinian refugees and cover the massive shortfall left by the U.S. administration."